Winter is just around the corner, and although it’s difficult to predict the weather this far in advance, we think the UK is long overdue a snowstorm or two. While the prospect of a winter snow flurry may be exciting for kids, for motorists trying to get to work, it can prove a real nuisance — and a potentially dangerous one at that. If the tabloids are right, and the UK does receive severe snow this winter, drivers will need to adapt the extreme conditions to stay safe behind the wheel. Here we’ll provide some top tips on how to drive in snow and sleet, so you can get from A to B safely this season. When the ice and snow gets really bad, some untreated roads — particularly B-roads — may be inaccessible, with patches of black ice catching unsuspecting motorists out. Before leaving the house, assess your route and decide if you think its safe to go that way. Occasionally, it might be better to change your route and stick to major roads you know will have been gritted and cleared of ice and snow — even if that means driving further. Did you know — it’s actually illegal to drive with a heap of snow on your roof? That’s why you should always set aside ten minutes before setting off to completely clear your car of snow and ice — particularly on your windscreen. For optimum visibility in even the most extreme weather, use a quality screen wash like Prestone’s Max Visibility screen wash — which melts ice down to -10°C. 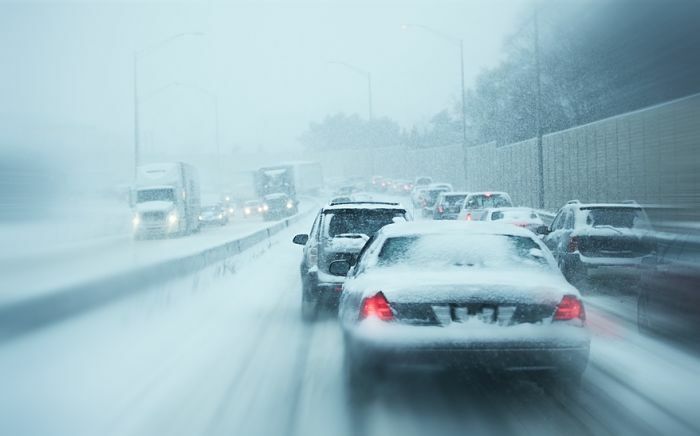 Driving in snow is a slow and arduous task, and tailbacks can soon develop as a result. Even if the snow hasn’t actually settled, a sudden shower can cause traffic to come to a standstill as motorists struggle for visibility. With this in mind, it’s important to give yourself extra time to get where you’re going, as delays are very likely. It’s all too easy to wheel spin off the line when pulling away in snow, but starting in second gear can help to reduce the chance of a skid. As you’re pulling out of a junction, try to be as gentle with the clutch as possible — easing off slowly to prevent the car going into an uncontrolled slide. There are few things dicier than attempting to drive up or down a snowy hill. If you’re heading uphill, try to keep the car moving at all times, even if it means waiting for the route to clear ahead. When you’re driving downhill, reduce your speed before reaching the descent, select a low gear and try not to use the brakes. Although it can be tempting to slam on the brakes when your car starts sliding on ice, doing so will lock the wheels and put the car into an uncontrolled skid. 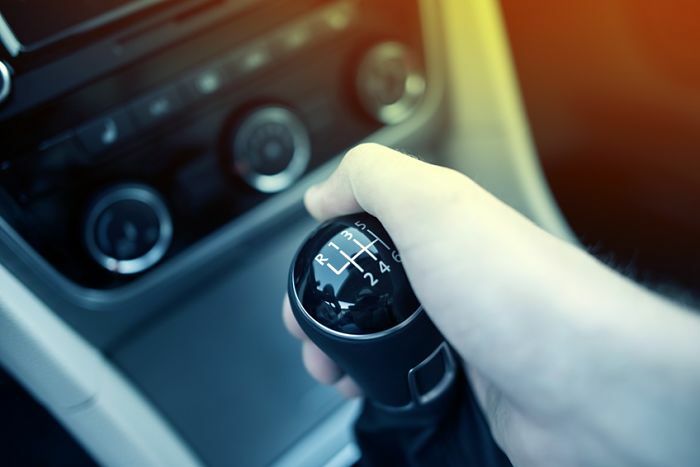 Provided you’re driving at a relatively slow speed anyway, it should be possible to slow down simply by taking your foot off the accelerator and selecting a low gear. Try to keep the car moving whenever possible, as this will reduce the risk of a skid when setting off and stopping. It’s a basic tip, but one we think deserves mentioning — make sure your shoes are dry before you start driving. 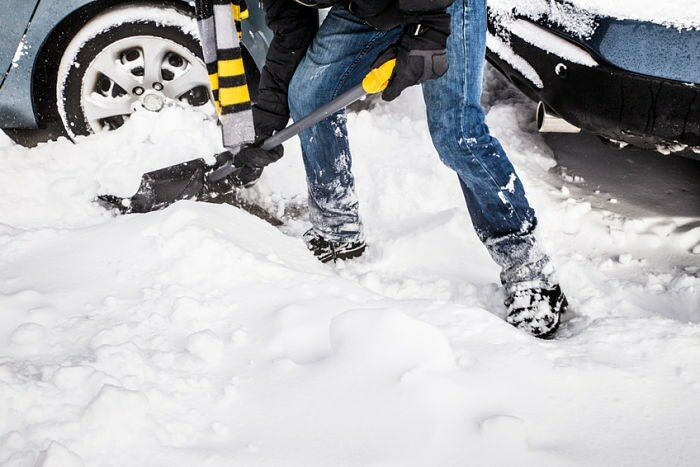 If you’ve just had to wade through an inch of snow to reach your car, your shoes will likely be extremely slippery, and this can cause your feet to slip on the pedals — not good when you’re trying to drive carefully in icy conditions. At Prestone, all of our products are tested in extreme conditions, so you can guarantee they’ll work whatever winter throws our way. To find out more, visit the Prestone website. Image Srouced Via Flickr Creative Commons. Credit: Clive Darra.